Ciudad del Este (Spanish pronunciation: [sjuˈðað ðel ˈeste], Spanish for City of the East; also known as CDE) is the second-largest city in Paraguay and capital of the Alto Paraná Department, situated on the Paraná River. It is located 327 km from Asunción, the capital, and is adjacent to the border with Brazil, to which it is connected by the Friendship Bridge on the Paraná River. It is the largest city within the Triple Frontier region, which borders Foz do Iguaçu, Brazil and Puerto Iguazú, Argentina. In the vicinity of Ciudad del Este are the Itaipú Dam, one of the largest hydroelectric power plants in the world; and the Iguazu Falls. Ciudad del Este is a commercial city, and is one of the largest free-trade zones in the world. Its tax-free status attracts many Brazilians and Argentines to the city. It has consulates of Argentina, Brazil, Mexico, Peru, Uruguay, Spain, France, Germany, Italy, Slovakia, Syria, Turkey and Taiwan. The Guaraní International Airport, the second most important airport in the country, located in the neighboring city of Minga Guazú, serves Ciudad del Este. In addition, the city is the home of Club Atlético 3 de Febrero, which has the Antonio Aranda Stadium that was used for the Copa América 1999 and is the third largest stadium in Paraguayan football. The city is home to Club Atlético 3 de Febrero, whose home ground Estadio Antonio Aranda was used for the 1999 Copa América, and is Paraguay's third biggest football stadium. The city is the seat of the Roman Catholic Diocese of Ciudad del Este. After the fall of Argentine President Juan Domingo Perón in the 1950s, the government of Alfredo Stroessner took the decision to vigorously promote the so-called "March to the East", seeking to reach the Atlantic Ocean, through Brazil. The main problem encountered in the exit through the Río de la Plata was the excessively expensive freight, which made the exported products commercially uncompetitive. In 1955, the Mixed Paraguayan-Brazilian Commission was set up to boost the highway to the East, and in 1956 a reconnaissance flight was made on Alto Paraná. The construction of a road route to the Paraná River bank was led by Captain Porfirio Pereira Ruiz Díaz, who supervised several army units in the building of a 200-kilometre section from Coronel Oviedo. Ciudad del Este was founded by decree on February 3, 1957, with the name of "Puerto Flor de Lis". Later it was renamed "Puerto Presidente Stroessner", in honor of the dictator Alfredo Stroessner. 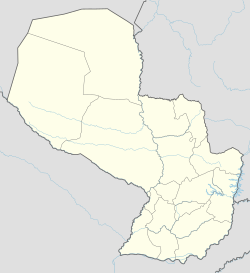 After the 1989 Paraguayan coup d'état, a referendum was held to decide on a new name, and Ciudad del Este was chosen. Settlement in the region was hampered by dense jungle, but the city and the local economy expanded rapidly after the construction of the Friendship Bridge and the Acaray and Itaipu dams between the 1960s and 1970s. The city has attracted many immigrants and now has Chinese, Arab, Indian and Korean populations. It is the second most developed and populated city in the country. The city, coextensive with the homonymous district, is located in south-eastern Paraguay. Part of an international tripoint known as the "Triple Frontier", Ciudad del Este lies opposite the Brazilian city of Foz do Iguaçu (state of Paraná). Separated from it by Paraná River, it is linked by the Friendship Bridge. The Argentine border is located between the neighbouring town of Presidente Franco and Puerto Iguazú (Misiones Province). Ciudad del Este, along with the towns and districts of Hernandarias, Minga Guazú and Presidente Franco, forms a metropolitan area named Gran Ciudad del Este (Greater Ciudad del Este). The location of Ciudad del Este on the international route that connects southeastern Bolivia with Curitiba and Porto Alegre has contributed to turning this city into a smuggling post between Paraguay and Brazil and of cocaine between southern Bolivia and the large cities of São Paulo, Curitiba, Porto Alegre, and Florianapolis. Because of this, many Argentine and Brazilian tourists visiting Lake Itaipú and the Iguazú Falls, both on the Paraná River, avoid Ciudad del Este. Amambay Stream, on the Monday side, feeds the Republic Lake. Acaraymí Stream, on the Acaray side, connects with the Amambay stream underground. Saltito Stream, located in the southeast, serves as a boundary with the jurisdiction of Presidente Franco. The Republic Lake, is the recreational site par excellence in the city. The Yrendy Lake, located in the neighborhood Monday about 1,000 meters from Route 7, was designated an ecological sanctuary[when?] for its beauty and natural wealth through a municipal resolution. The José Costa Cavalcanti bridge over the Acaray river, popularly known as "Puente Seco" (Dry Bridge), is a junction between Mariscal López Avenue and the Itaipú Superhighway which connects the Pablo Rojas neighborhood with the Paraná Country Club of Hernandarias. The Peru bridge, over the Acaray river, connects the Don Bosco neighborhood with the Itaipú neighborhood of Hernandarias. Ciudad del Este has a humid subtropical climate under Köppen's climate classification. Summer is hot and humid, with an average of 26 °C (79 °F) in January. The high humidity usually becomes suffocating in the heat. Winter is temperate and irregular; temperatures between 0 °C (32 °F) and 30 °C (86 °F) have been recorded. The average daily temperature is 16 °C (61 °F) in July. Ciudad del Este sees on average roughly 1,700 millimetres (67 in) of precipitation annually. In the winter of 1982, it snowed for the first time in the city, being the second snowfall registered in the country. It is the second most important city in the country, after Asunción. It gathers 8% of Paraguayan Gross Domestic Product, that is, about 3.5 billion dollars. Some 244 companies are installed which operate in the Services Sector and in the Industrial Sector, among which stand out the manufacture of auto parts, the textile industry, maquilas, industries developer, and others. The agro-livestock activity in Ciudad del Este is null because it does not have rural areas, however it emerges as a regional nucleus of other adjacent urban centers that do have it, such as Hernandarias, Presidente Franco and Minga Guazú. In the city operates a large food market that has more than 800 shops where fruits, vegetables, and clothing are sold. Ciudad del Este has repeatedly been on the list of notorious markets for infringing goods by the United States Trade Representative. The city is the headquarters of the company that operates the nearby Itaipu Dam. The city's economy (and Paraguay's economy as well) relies heavily on the mood of the Brazilian economy, as 95% of Paraguay's share of the energy generated by the Itaipu Dam is sold to Brazil (for US$300 million), and that every day many Brazilians cross the border to buy less expensive products (US$1.2 billion, mostly electronics). Smuggling is a major occupation in the city, with some estimates putting the value of this black market at five times the national economy. It is reported that Lebanese immigrants with links to Hezbollah are operating money laundering activities and cocaine trafficking in the city. A few decades ago Ciudad del Este has seen the development of a very attractive offer in terms of electronic and computer products, as well as consumer products, although luxury (perfumes, fine alcohols, and others). The economy of the city has diversified, led essentially by the installation of new industrial activities outside the traditional commercial focus, such as agribusiness, because in the city are located the largest agricultural companies in the country. Likewise, similar to what happens with the border cities of Paraguay, it depends to a large extent on trade with Brazil. 20 km to the east, on the border between Argentina and Brazil, are the majestic Iguazu Falls. Located near the center of the city, there is founded the «Lake of Republic» which is surrounded by vegetation which takes advantage of the waters from the Amambay stream and has a recreation area with an open-air amphitheater that offers the community a public place where Enjoy artistic and cultural events. In its surroundings there are also walkways, bike paths, rest areas, playgrounds, gym and gastronomic venues par excellence. The 3D Planet Museum is a space located within the Paris Shopping. These are 3D paintings hand painted by international artists, among which the Great Wall of China, the Iguazu Falls, the Roman Colosseum, Venice, Africa and outer space stand out. It also has a labyrinth of mirrors among the multiple attractions exhibited in rooms divided into five different areas. The shopping center has also a snow park. El Turista Róga (Tourist's home), is a dependency of the National Secretariat of Tourism (SENATUR), located in front of the Green Park, near the center of the city. This one is specialized in orientation and reception of tourists, also has a reception room and wide information suitable to deliver brochures and explanatory leaflets in languages such as English, French, Italian, German, Korean, Portuguese and Spanish. Ciudad del Este is the most populous city in the country after Asunción, with a population of 301,815 persons, being 152,393 men and 149,422 women, according to projections of the DGEEC for 2019. It represents 36.8% of the departmental population (819,589) and 4.22% of the national population (7,152,703). Ciudad del Este is a multicultural and diverse city. It is home to a large Asian-born population, specifically of Taiwanese, Korean, Lebanese and Iranian origin, evident in the city's mosques and pagodas. The Taiwanese government paid for the construction of the city's town hall in exchange for Paraguayan support in the United Nations, hence the Taiwanese flag that flies on the building. From the 1970s, Sunni Muslim Arabs moved to the city. This changed in the 1980s to Shia Muslim Arabs from South Lebanon. As in the rest of the country, a large part of the population dominates spanish and guarani, in addition to jopara, but in the city portuguese is also daily common for thousands of people and is mainly used in the commercial and agricultural sector. Thanks to the strong presence of Asian and Middle Eastern immigrants, languages such as arabic, chinese and korean are commonly used in the downtown area of the city both in conversation and in posters. Source: Census of the DGEEC. (*) Projection of the DGEEC - 2015 Edition. Ciudad del Este is organized territorially in 30 neighborhoods. Route No. 7 "Dr. Gaspar Rodríguez de Francia" divides the city into two parts: 9 neighborhoods in the north and 21 neighborhoods in the south. The Microcentro neighborhood is the only one located in the middle of Route 7, extending minimally on the north side. Although it is a relatively new city, and unlike other cities such as Asunción or Luque which stand out for their colonial mansions, similarly it does not exempt it from having buildings of classical architecture, something that can be noticed in the Plaza Jesuitas Shopping, a shopping center inspired by the typical colonial architecture of the 16th century. Esteña architecture is predominantly avant-garde, both in conventional buildings and incorporate centers. Ciudad del Este has diverse spaces with densely populated arboreal areas. Among the main parks include the Ex-airport Alejo García park, the Monseñor Agustín Van Aaken park, the Bernardino Caballero park, the Acosta Ñu park, the Green Park and a score of other places. Emblematic and popular sites such as the Alejo García park (Ex-airport) and Monseñor Agustín Van Aaken park offer different recreation areas such as bicycle paths, aerobic stations, skateboarding tracks and so more recreational games. Along the Los Yerbales Avenue, parks like "Manuel Ortiz Guerrero", "José Asunción Flores", "Salto del Guairá", and "Guayaivi" are all natural spaces whose main function is to conserve regional biodiversity. On the other hand, the Linear Park is a project financed by Itaipú Binacional and is focused on the use of the first three parks mentioned above; This project is based on the remodeling of green spaces for citizens' free access. The Linear Park, of about 50 hectares, is equipped with sanitary sewer systems, water network, video surveillance system, trails, cycle paths, free access to WIFI networks, playgrounds, outdoor gym, senior area, sector for food truck and a new effluent drainage system. Given the growth of the metropolitan region at a vertigo speed, plans are being projected for the development, reconversion and urban planning with a view to converting it into a sustainable metropolis. The redesign plan of this area of the country will be concreted by architects, civil engineers and Argentine professionals, who will advise this undertaking whose purpose is to transform the outdated road structures through an integral plan viable for the future. Guarani International Airport, located in the suburb city of Minga Guazú, connects the city with other South American destinations. Slovakia – Honorary Consulate: Calle Boquerón 310, Edif. Grupo Monalisa S.A.
INTERPOL – The city has a regional office of Interpol. Ciudad del Este was featured during a late season 8/early season 9 storyline on the television series JAG in 2003. In 2005, it was a filming location for Miami Vice, a film directed by Michael Mann and based on his television series of the same name. The Triple Frontier (or here referenced as the Tri-Border Area) was featured as the backdrop for the NCIS Season 2 episode "An Eye for an Eye", as NCIS Special Agents Anthony DiNozzo (Michael Weatherly) and Caitlin Todd (Sasha Alexander) traveled to this area of southern Paraguay in order to investigate a professor involved in a case in which a pair of blue eyeballs were mailed to a man who then committed suicide. A deleted scene from this episode would later be shown in the Season 8 episode, "A Man Walks into a Bar" as the team remember their dead colleague, Agent Todd. The city is the setting for the 2014 graphic novel "Cuidad", written by Ande Parks and illustrated by Fernando Leon Gonzalez. A mission from Ubisoft's game "Tom Clancy's Splinter Cell Blacklist" is set here. Axel Bachmann: Chess player, two-time Ibero-American chess champion (2013-2014). Dallys Ferreira: International model and theater actress. Lourdes Motta: Miss and International Model. Mario Orrego: Musician and composer. Pablo Vourliotis: Clarinetist and Orchestra Director. ^ Schemo, Diana Jean (March 15, 1998). "In Paraguay Border Town, Almost Anything Goes" – via NYTimes.com. ^ "Consulates in Ciudad del Este, Paraguay". ^ "50 AÑOS DE HISTORIA". ultimahora.com. ^ "Ciudad del Este - Dictionary definition of Ciudad del Este - Encyclopedia.com: FREE online dictionary". www.encyclopedia.com. Retrieved 11 April 2018. ^ "Yrendy, santuario ecológico de CDE". ultimahora.com. ^ "Ciudad del Este Climate Normals 1961–1990". National Oceanic and Atmospheric Administration. Retrieved January 23, 2015. ^ Savitz, Eric. "Baidu Hits U.S. List Of "Notorious Markets" For Infringing Goods". Forbes. Retrieved 2017-03-07. ^ "2016 Notorious Markets List Spotlights Fight against Global Piracy and Counterfeiting of American Products | United States Trade Representative". ustr.gov. Retrieved 2017-03-07. ^ Schemo, Diana Jean (March 15, 1998). "In Paraguay Border Town, Almost Anything Goes". New York Times. ^ "Lebanon Is Protecting Hezbollah's Cocaine Trade in Latin America". Foreign Policy. 15 June 2018. Retrieved 18 June 2018. ^ John Tofik Karam, (Un)covering Islam and Its Fifty-Year History in a South American Frontier Region Archived 2011-01-07 at the Wayback Machine (2011), Florida International University. ^ "Bienvenido a Consulado General en CIUDAD DEL ESTE | Consulado General en Ciudad del Este". ccest.cancilleria.gov.ar. ^ "Ciudad del Este - Consulado Brasil em Ciudad del Este". www.embaixadas.net. Retrieved 11 April 2018. ^ "Consulate of France in Ciudad del Este, Paraguay". www.embassypages.com. Retrieved 11 April 2018. ^ "Consulate of Mexico in Ciudad del Este, Paraguay". www.embassypages.com. Retrieved 11 April 2018. ^ "Departamento de Identificaciones". Foursquare. Retrieved 11 April 2018. ^ "Sexta Circunscripción - Alto Paraná - Poder Judicial". pj.gov.py. Retrieved 11 April 2018. ^ "Libanés con doble identidad está preso en Interpol". ultimahora.com. Retrieved 11 April 2018. Wikimedia Commons has media related to Ciudad del Este.